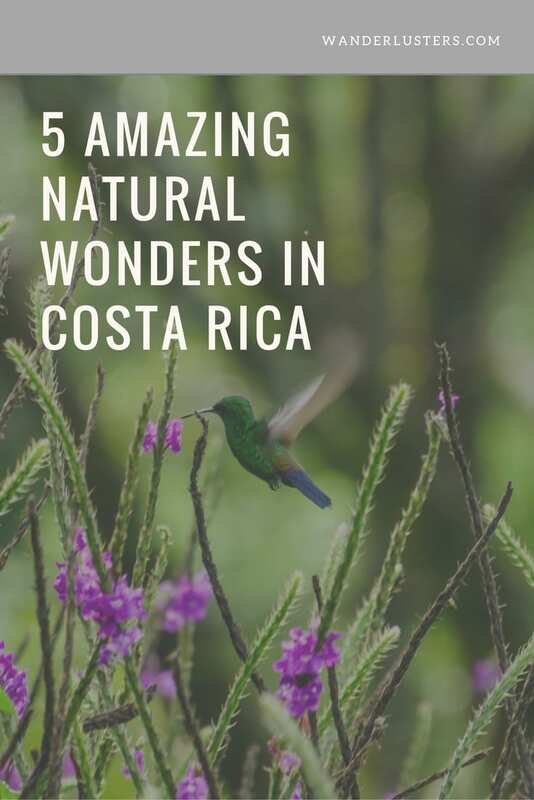 Having spent six months house sitting in Costa Rica during 2011, we wanted to highlight some of the country’s natural wonders that inspired our trip. 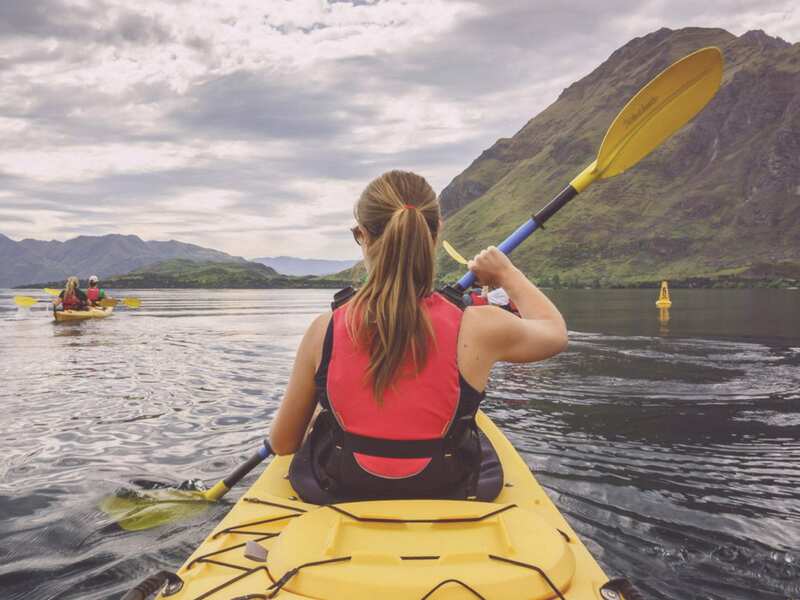 Forming one of the greatest densities of life anywhere in the world, visitors to Costa Rica are treated to an array of landscapes, climates, and wildlife that inspire one’s imagination and desire for exploration. House sitting in Liberia and Playas del Coco in the north, and Ojochal in the south, we used the time in between assignments to unearth areas of Costa Rica’s spectacularly rich landscape. The literal English translation of Costa Rica is ‘rich coast’ and on visiting it is evident why, the diverse mix of flora and fauna create a paradisical environment bursting with life. This nondescript beach is the setting for one of the natural worlds most incredible events, The Arribada. Translated the term means ‘the arrival’ and is a fitting description for the event that takes place on the beach each month during the week before a new moon. 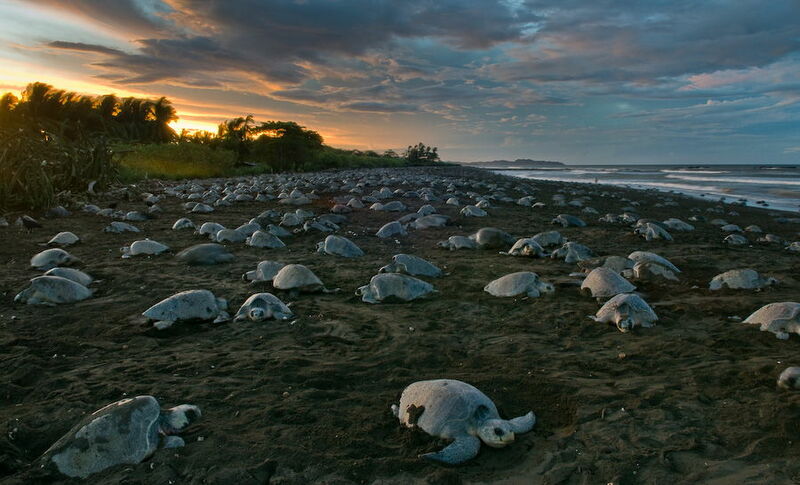 One of the worlds most important nesting sites for the olive ridley sea turtle, if you time your stay just right you can witness hundreds of thousands of turtles emerging from the ocean to lay their eggs in the black volcanic sands. Only olive ridleys and their close relatives the kemp’s ridley sea turtles synchronise their nesting in mass ‘arribadas’, and the events are draped in ritual. The animals congregate off shore in a ‘flotilla’ during the days before the new moon, waiting for a signal to descend on the beach. No one knows exactly what prompts the invasion, however it is clear once the arribada has begun. Over the course of the next four to seven days the turtles fight their way from the shore, through the sands, to the perfect nesting site. Laying their eggs they cover them in a layer of sand and begin the exhausting journey back into the ocean. With so many turtles battling for nest space, those arriving later often disturb the carefully laid nests of their predecessors much to the delight of the locals. Costa Ricans believe turtle eggs to be an aphrodisiac and collect a regulated number from the beach during the arribadas. Ostional is the only place in the world where harvesting turtle eggs is legal. Through extensive research scientists have noted that most of the eggs deposited in the first few nights of an arribada are destroyed by subsequent turtles who dig their nests. Consequently the government of Costa Rica allows the community of Ostional to harvest the ill fated eggs during the first three days of an arribada. As a way of thanks the villagers protect the turtles from poachers and ensure the beach is free from debris. Read an arribada report by fellow nomads Dani & Jess who caught the action live during their Costa Rican adventure. The Volcan Rincón de la Vieja National Park is a relatively unknown natural gem of the Costa Rican interior. 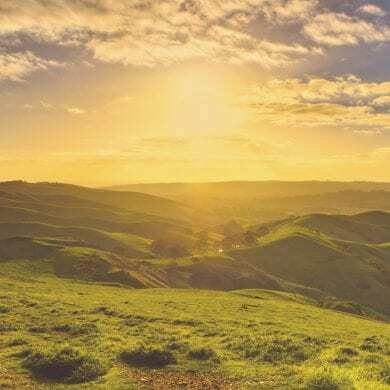 Home to an intriguing mix of volcanic geology and tropical forests, the main attraction is the smooth cinder cone volcano that comprises nine adjoining craters spanning the 34,800 acres of the park. Sitting in the Cordillera de Guanacaste (Guanacaste Mountains), the area is famed for its heavy volcanic action during the 1960’s however only one crater remains a threat. The Von Seebach crater is continually venting steam and produces the occasional volcanic burp hinting at the destructive might within. Home to a diverse eco system a visit to the national park may provide a glimpse of armadillo, squirrel, white-faced or capuchin monkeys, black ctenosaur lizards or boa constrictors. Walking trails stem from the Santa Maria ranger station and zigzag their way through the park, for the less energetic there is a sulfuric hot spring just 3 km up the trail. The best time of year to visit is the green season, May – November, as this is when the fumaroles and boiling mud pots are most active. However the craters are more likely to be covered in low cloud so check the weather forecast before setting off on a long hike to the top of Rincon de la Viej. The name Rincon de la Vieja is translated as ‘Old Woman’s Nook’ and steams from a local legend recounting the story of a young woman whose father threw her lover into the volcano causing her to shut herself away from the world. Check out this hiking report by trans American explorer Dan. Three hundred miles south west of Cabo Blanco sits one of Costa Rica’s uninhabited islands. Now listed as a world heritage site, Jacques Cousteau pronounced Cocos “The most beautiful island in the world” and it is easy to see why. Formed during a volcanic upheaval its rugged coastline is spectacular, with four mountainous peaks covered in lush vegetation it is a snapshot of our earth in prehistoric times. A world renowned marine park the island is surrounded by deep waters with counter-currents that attract populations of sharks, rays, dolphins, and whale sharks to name a few. The extremely wet climate and oceanic character of Cocos make it unlike any other island on the planet. Above the waterline the wealth of diversity continues. There are more than ninety species of bird including the famous Cocos Island cuckoo, finch, and flycatcher. Countless endemic insects and two native reptiles are only found on the Island. In the fresh water rivers and waterfalls are fish that befuddle scientists by their very existence. There are very limited ways to experience the bio diversity of the island. 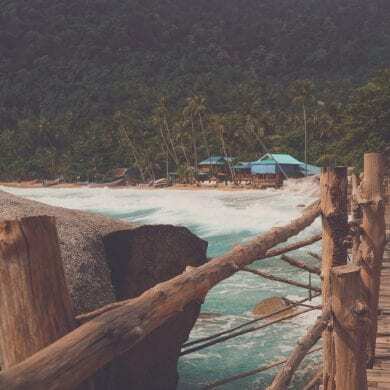 Accessible only by sea, the thirty two hour crossing from the mainland is not chartered by any tour companies and access to the island must be granted by the ranger prior to your arrival. The best way to experience the beauty of Cocos is on a live aboard dive boat, with only two companies licensed to operate, this is a trip of a life time it comes with a similarly memorable price tag. If you’re an adventurous sort you might like to take the opportunity to jump in the underwater sub that visits depths of up to 350m, that’s 310m deeper than the recreational scuba diver ventures. The sub is managed by one of the two dive boats and offers adventurers the chance to visit an area of our earth that very few have explored. Read a trip report from 100m below by fellow scuba loving nomads Eric & Karen. The route to the Cloud forest of Monteverde is a well trodden one. Thousands of backpackers and tourists flock to the town of Santa Elena to catch a glimpse of the bio diversity on offer. 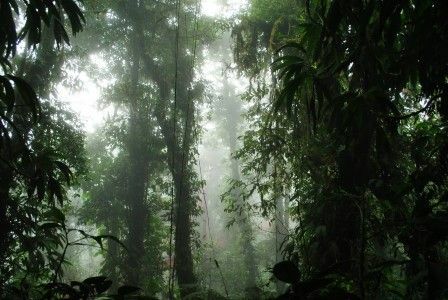 The varying altitude and climate provides a unique set of conditions which enables a wealth of wildlife to thrive in the forests. Jaguar, ocelot, bare-necked umbrellabird, countless frogs, toads, salamanders and newts, along with the famously elusive resplendent quetzal, are just a few of the animals you may catch a glimpse of as you explore. Towering trees, hanging mosses and vines give the landscape an eerie majesty and during first light the early morning mist snakes its way through the vegetation. It is the damp climate that provides the habitat for such a wealth of unusual vegetation, and when visiting the reserve you will be astounded at the sheer size of many of the trees and leaves. On entering the reserve you can explore the various trails on foot or partake in some of the adventure sports on offer. Alternatively you can visit the short stay aquarium in the field station where examples of native wildlife are housed temporarily to provide those less willing or unable to venture out, a glimpse of what surrounds them. 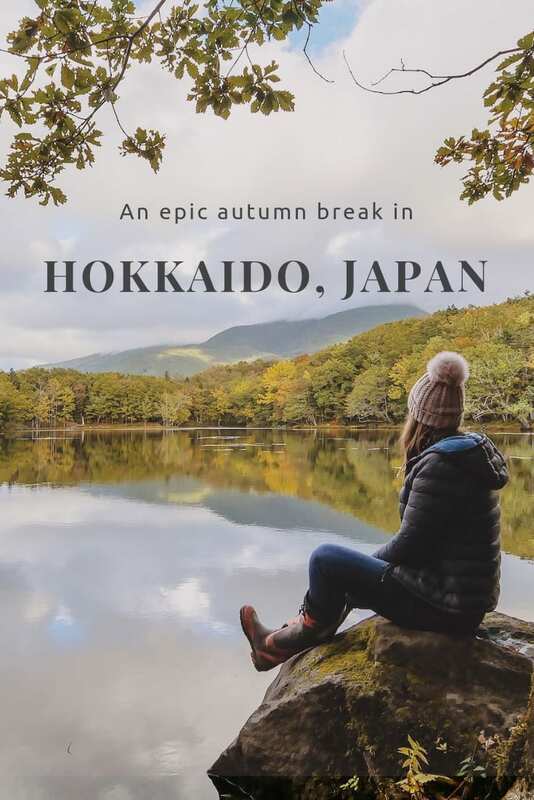 We stayed at a brilliant bed and breakfast and utilised the owners knowledge of the area to book some of the activities on offer. 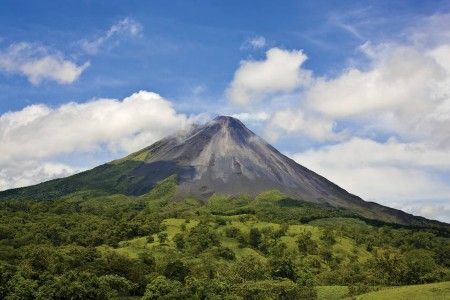 Until 2010 Arenal held the coveted title of Costa Rica’s most active volcano, its daily puffs of smoke and frequent lava bursts have made it a famous icon of the country’s diverse landscape. 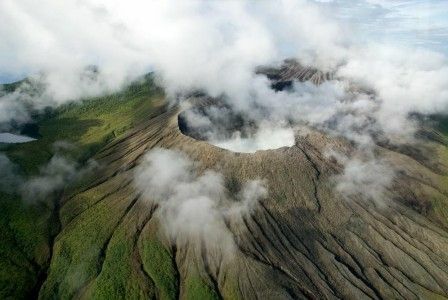 Famously surprising locals one morning in 1968, their 7:30am alarm had a slightly different ring when the volcano that was previously thought to be extinct, erupted violently for a three day period. Although it is now dormant, no one is quite sure how long until its slumber is broken and lava begins to bubble to the surface once more. The Arenal Volcano National Park has two volcanoes, the 5,357-foot Arenal Volcano and the 3,740-foot Chato Volcano. The latter has been inactive for nearly 3,500 years and has a collapsed crater that contains a beautiful lagoon. Thanks to the geothermal activity deep beneath the base of the volcano the surrounding flat lands are home to some natural hot springs. The town of La Fortuna that sits in the volcano’s shadow, hosts tourists and travellers keen to catch a glimpse of the lava flow and soak their weary bodies in the medicinal warmth of the volcanic springs. Our stay in La Fortuna was brief and we didn’t manage to catch sight of the lava flow, we did however manage to zip line across the adjacent valley and wakeboard on Lake Arenal. Our Costa Rican adventure provided a wealth of wanderlust fodder and ignited our desire to explore much more of the incredible Central and South American landscape. If you’re planning your own Costa Rican adventure and are keen to hear more about my stay in the country get in touch or leave me your comments below. 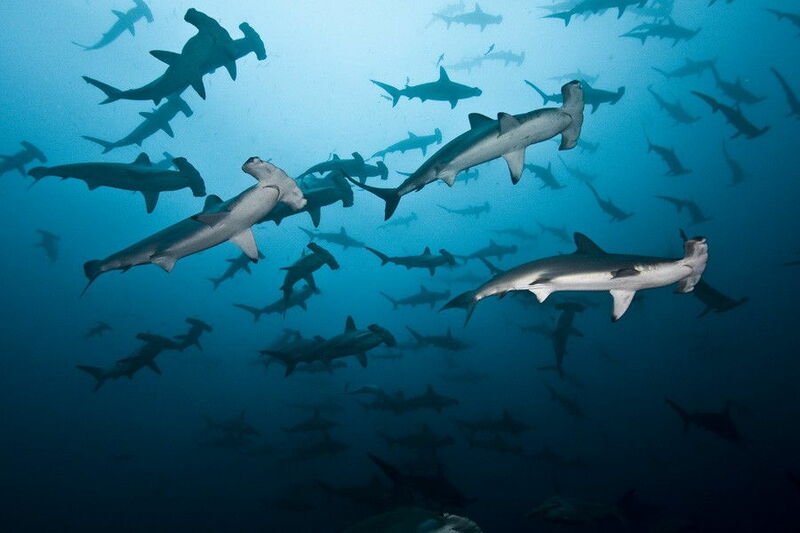 Thanks for including a link to one of our posts about our adventures with sharks, rays and submersibles around Cocos Island! We visited all of the places on your tidy list during our time in Costa Rica (and then some) and we can honestly say that Cocos Island was our number one natural world adventure in the country. Thanks for stopping by Karen. Your posts from the trip to Cocos really got out scuba juices flowing! The fact that you rate it so highly just makes us want to down tools and fly back to Costa Rica even more! 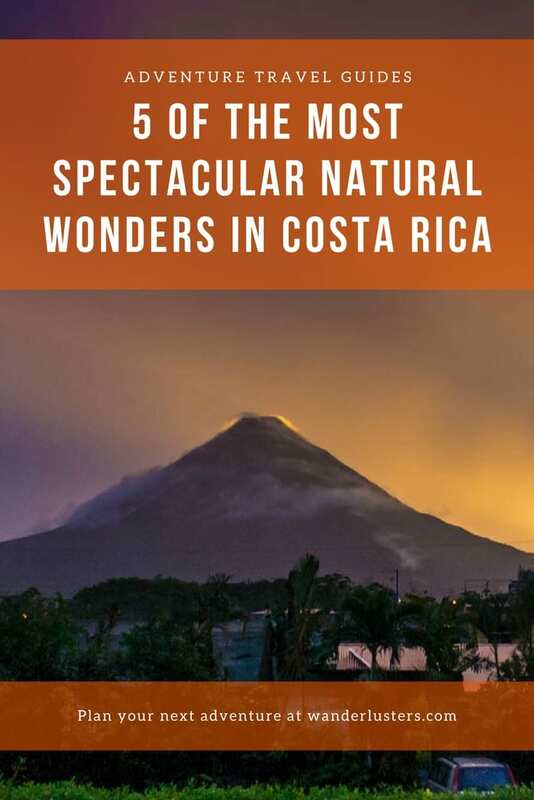 This is such a great resource on the wonders of Costa Rica. This has been a destination we have wanted to visit for awhile but has always eluded us. We would love to zip line in La Fortuna and dip in the hot springs. Thanks Mary. It’s such a diverse country, I wish we had been able to spend more time exploring. There just aren’t enough hours in the day! We’ve been to Arenal and loved it! We plan on going to the Ostional Wildlife Reserve – The Arribada in August 2013! Looks amazing! Any tips?!? You’ll have to pop over to GlobetrotterGirls, we didn’t make it in time for the Arribada. Their report of it is superb! So far we have crossed off 2 on this list; Arenal and Monteverde. LOVED both! In fact we have already decided we want to come back t CR and spend a week or 3 in a cabin somewhere in/near La Fortuna. Oh wow, lucky you! We actually rented a cabin in La Fortuna for a week. I think I spent 23 hours a day in the hammock on the balcony! Views of the volcano and lush rainforest surrounds. Heaven! We are in Costa Rica right now and loving it. Heard about Cocos Island just yesterday, sounds great. We are headed to Arenal next week. Can’t wait, and are hoping for clear skies. Great stuff! Are you going to visit Monterverde too? If you do send us an email, we have a great friend who lives there and runs a small bed and breakfast, he’s a superb fellow and would love to show you around! 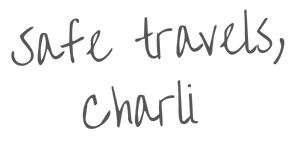 Thanks for the tip Charli (BTW that’s our daughter’s name)but I don’t think we will make it to Monteverde. Gonna hang around Manuel Antonio for a couple days then San Jose, then Arenal. Great list of the most amazing natural wonders in Costa Rica, a place full of nature. Totally agree with your destinations, Isla del Coco is a paradise on the Earth. Arenal and Rincon de la Vieja are the most beautiful volcanoes in Costa Rica. We LOVED Costa Rica – the rainforest and wildlife are just incredible. One of the best trips we did was our four day adventure in Corcovado National Park. Incredible hiking, wading through crocodile-infested rivers, running across a herd of peccary, awesome birdwatching… Highly recommended! Great, we have been to Costa Rica last year and seen the Monteverde Cloud Forest – great ziplining, horse riding and coffee tour. Best for me was the Corcovado Park, though. 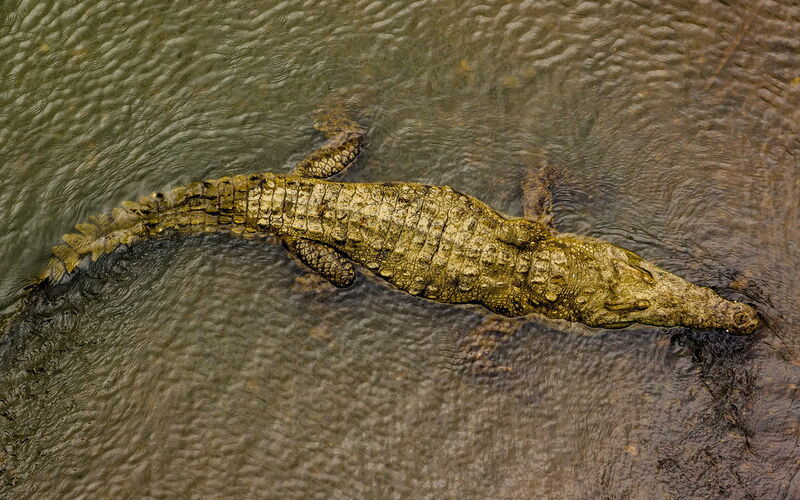 Tarcoles and the crocodiles are also very beautiful. Still so much to see in this beautiful country, we will return for sure and combine it with Panama. Costa Rica is certainly home to wonderful, natural sites. This post is a great review of many of them. We moved to the Central Valley last year after retiring in our early 40’s and we are getting to see all of these sites… and more. 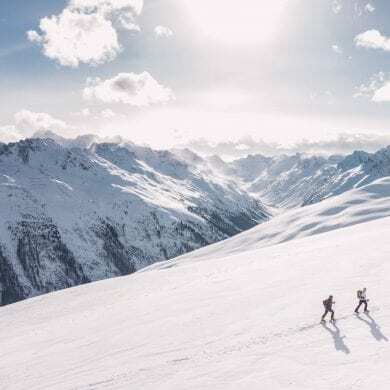 Great post and I love your photos. Now I can’t wait to see Costa Rica! 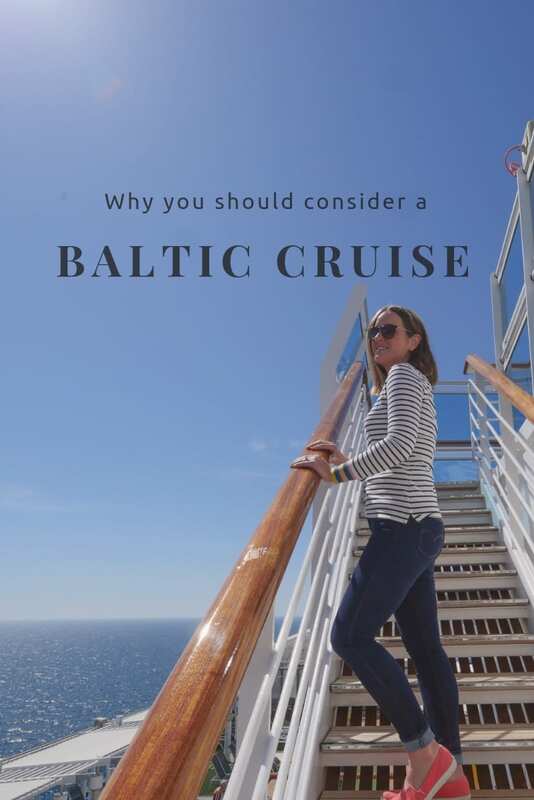 Hey Caitlin, great to hear you’ve found our guide useful! We’d recommend taking the time to join the crew at Rich Coast Diving whilst you’re in Playas del Coco – tell them we sent you, owners Brenda and Martin will get a kick out of it as we spent 6 months there training to be dive masters! The Bat Islands and Catalins are two trips worth doing if you go during bull shark season 🙂 Happy travels!